Get in the holiday spirit and discover Christmas traditions from around the world without ever leaving the good, old USA! Join our other world travelers as we head westward to Omaha! Omaha? Yes! Omaha! ENGLAND: First stop, an Authentic Madrigal Christmas Feast is served while costumed Renaissance performers entertain. OMAHA CITY TOUR: Your local co-pilot gives the group a candid look at the city's past, present, and future while giving an overview of this great city. 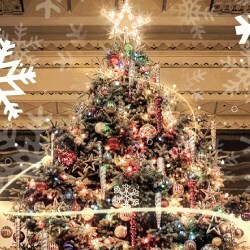 CHRISTMAS AT UNION STATION: Step back in time as Union Station is magically transformed for the holidays! GREECE: First, enjoy a tour of St. John's and learn the history of the church building. Next, savor authentic Greek cuisine before the presentation of the Vasilopita, the Greek traditional New Year's Bread. Finally, experience traditional dance that will take you away to Greece. Opa! IRELAND: Enjoy a tour of the Hall of History and Father Flanagan's historic home, decorated in the traditional style of an Irish Christmas in the year 1929! HOLIDAY POINSETTIA SHOW: Walk through a wonderland of 5,000 poinsettias at Lauritzen Gardens. Did you know poinsettia's originated in Mexico? OMAHA COMMUNITY PLAYHOUSE: Kick back and enjoy a Christmas production in the largest community theater in the nation! Show to be announced. DAVE MARSH DINNER: Conclude your world travels with a dinner while David Marsh entertains with international Christmas carols that will have you singing along. Keep that Christmas spirit with you as the coach travels home just in time for your own traditions to begin! DEPOSIT: $50 at time of reservation; final payment due October 22, 2019. ACCOMMODATIONS: Magnolia Hotel, Omaha, NE (3 nights). TOUR INCLUSIONS: Professional tour director, motorcoach transportation, accommodations, luggage handling at hotels, admissions/attractions, and 7 meals, including 3 breakfasts, 1 lunch, and 3 dinners.